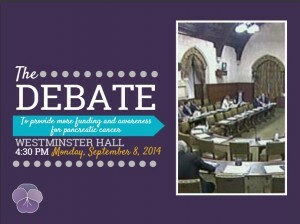 Thanks to over 106,000 government epetition signatures, a parliamentary debate on the dire situation for Pancreatic Cancer patients has been scheduled for 8th September. 40 years ago only 4% of those diagnosed lived 5 years. In 2014…..NOTHING has changed. Roughly 9,000 people were diagnosed in 2009. By the end of this year only about 180 of them will still be around. It is one of the most ignored and most deadly cancers. Gaining those petition signatures was a Herculean achievement, but we can’t rest now and let the blood, sweat and tears go to waste. Please contact your MP and ask them to attend. We would all HUGELY appreciate your help (Pancreatic Cancer charities, those with PC, the Purple Army of families and friends affected by this and anyone who might have their life destroyed by it in future). This post “Why Not Add Your Voice – The Pancreatic Cancer Debate” shows you how very hard 100s of very special people fought and how much we can achieve with lots of determination and support from folk like you. Tweeting, Facebook posting, emailing and everything else is very much appreciated. If you are kind enough to help, maybe share this impactful animated graphic underlining the dire need for action. A little more than 3 months she died and there’s news she would have loved to hear. The loss still feels enormous, but perhaps, if this debate gets the deserved support, we can save many, many other people from going through this. County tennis player, accountant, independent business woman, developer and interior designer of lovely homes, stylish dresser, superb cook (especially cakes and roast dinners), debater of current affairs, avid reader, Archers listener, royalist, pig collector, sports fan (never got to watch my programs as football, rugby, tennis, golf, snooker, cricket were always on), lover of her gorgeous garden, word mixer upper (infidential conformation was a fave), Spotty Dog from Watch With Mother impersonator, set the world to rights over a bottle of good red wine-er, laugh til she cries at silly humour-er, comforter, badgerer, advisor, coper. Brave and pragmatic beyond belief when faced with pancreatic cancer. Taking precious time out of a cruelly shortened life to help us campaign for more research and better treatment. Died aged 69, almost exactly 9 months post diagnosis, with my sister and I holding her hand and listening to the dawn chorus. Any kind wishes are most welcome, but getting the debate the attention it deserves and/or a small donation to the Pancreatic Cancer UK charity would be enormously appreciated and may one day prevent other families going through this. They support patients and carers, fund research and lobby parliament to do more about poor pancreatic cancer diagnosis and treatment.